The European Foundation of Human Rights (EFHR) would like to invite you to take part in a training called “The Language Rights of Linguistic Minorities: International Standards and their Significance”. 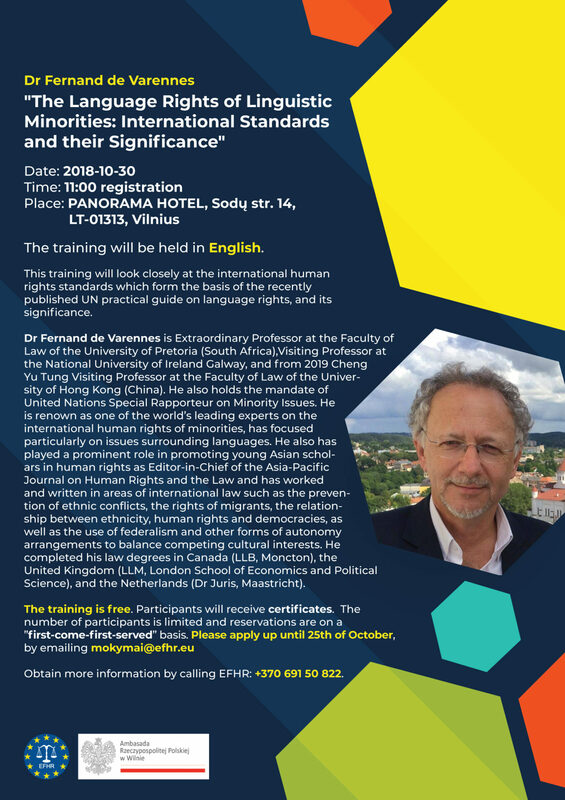 The training will be conducted by Dr Fernand Varennes – an extraordinary professor at the Faculty of Law of the University of Pretoria and Cheng Yu Tung which since 2019 will be a professor at the Faculty of Law of the University of Hong Kong (China). He also has a mandate of the UN Special Rapporteur on Minorities, and focussed particularly on the issues relating to languages. The trainings are aimed at all the people interested in human rights. We invite lawyers, advocates, prosecutors, employees of non-governmental organisations, students and everyone willing to participate. Participating in the training is free of charge. Each participant will receive a certificate of participation. The training will be held in English, on 30 October at 11:00 a.m. till 4:00 p.m. in “Panorama” Hotel at Sodų 14 in Vilnius. To sign up write to us at: https://goo.gl/sWrjyy or send us an e-mail: mokymai@efhr.eu till 25 October. The number of places is limited. For more information call +37069150822. Training program will soon appear at www.efhr.eu and on Facebook https://www.facebook.com/EFHR.EU/ . EFHR for years have been organising various trainings conducted by highly respected specialists in international law. More information about other EFHR trainings you can find here. The patron of the project is the Embassy of the Republic of Poland in Vilnius.